SESSION DETAIL: You will initially receive your chakra portrait as a graphic image in a DropBox.com folder (no need for an account, but a free account is easy to setup). You will review the information in the charts presented on the right side of this page to do a self interpretation of your portrait. Meditate on what you receive and make notes. In several days, Shivanti will send you an audio recording of the reading in your DropBox folder. At this point, you will spend some time reviewing the information and follow up with an email asking any additional questions you may have about the reading. You can also do this in a live chat, phone or Skype call if you prefer. Shivanti provides you with a core level reading of your 12 main chakra system, which means the ones that you operate from at the foundation level of your being, not the one that shifts and changes depending on the activity you are involved in. Shivanti has developed a very high level of clairvoyant and intuitive abilities to bring these readings through for you. She uses dowsing techniques as a method to determine the spin and functioning status of each chakra, both the front and the back aspects (see Symbols chart below). With this information, using the basic information from the Personality Traits Chart below, she will then give you an audio recorded interpretation of how your current chakra patterns are affecting your life. Understanding your personal chakra system can be as valuable as understanding the functioning of any of the other complex systems within the bio-energetic matrix that encompasses the whole of who you are. Once you have an understanding of the functions and relations that each chakra has to your overall personality makeup, the better you will be able to understand why you are experiencing certain situations in your life. With that understanding, you will be able to make the adjustments, with the control of your consciousness, directly to the chakra that is causing an imbalance. You can review the charts and diagrams below to help you understand the different aspects of each chakra position. There are many different ways to understand and interpret the chakra system. For the purposes of this reading, these charts will provide you with our diagnostic system along with many other teachings also incorporated. You can receive these readings every 3-4 months, as they will be different each time you receive one. You also want to give yourself time to make the necessary shifts in your field with your own spiritual growth processes. The changes occur gradually as you are a complex energy system, constantly changing with your thoughts and experiences. For change to take place you will need to make a conscious effort to change the circumstances in your life that may be contributing to your blocks or resistances. Shivanti will provide you with suggestions and meditations to assist you in bringing your chakras towards a state of balance. This is an excellent way to monitor the spiritual growth work you are doing and to stay focused on what is important to be working on to allow for the greatest continuity of flow in your life. This is also where using the multidimensional QSET music from ShapeshifterDNA will play a key role in assisting you during these shifts. While each of these main chakra points are responsible for specific aspects of one’s personality makeup, it is the combined energy between them that really needs to be understood – it is fine to have an open third eye (6F), but if the back (6B) is closed or low, then one will not be able to fully see the steps needed to actualize their visions, plus if 4B were closed, one would not have confidence in themself to put plans into action. If 3F were also closed, then one would lack personal power to believe they could acutally do what their visions are showing. 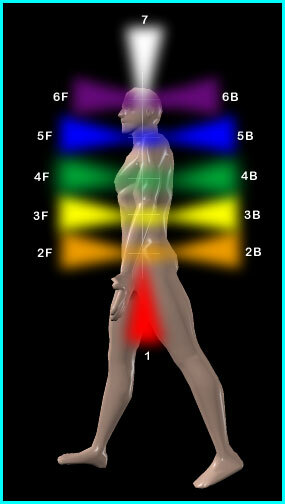 It is a complex holographic system and each chakra depends on the others to fully function as a whole being. Shivanti will be able to teach you how to understand your chakras and balance them so you can learn which ones you might want to charge up depending on the tasks or goals you are trying to achieve. The following symbols are used to diagnosis your chakra system. A chakra functioning at its optimal level is C6 (clockwise 6″). Refer to your specific reading using this chart as a guideline. Ideally for those on a dedicated spiritual path, one should have mostly C and V readings, at about a 3-4 range, with the eventual goal of all C6s, but this takes time and much spiritual growth to attain. Those on a dedicated spiritual path fluctuate now between Cs and Vs as we are all integrating higher and higher levels of the incoming frequencies. Be sure that you are using the soundscapes from ShapeshifterDNA on a daily basis to continue to increase, balance and integrate these incoming waves. Start with the Odyssey 1 Minute Chakra Balancing Program to balance, ground and expand your field, then gradually start working with all the other soundscapes in the catalog as they will assist you in all areas of your evolutionary journey. The Odyssey comes with an optional guided journey to help you learn how to balance your chakras. Check out our Products pages on this site for Guided Journeys and our suggestions for the Soundscapes.